Learning to eat well can also be fun with this vibrant pop-up book. Children can check items off of the grocery list as they find the foods in the pop-up supermarket included in the book. And at the very end, they’ll find a table on which they can prepare their healthy meals. Healthy eating and play combine in this truly unique book. 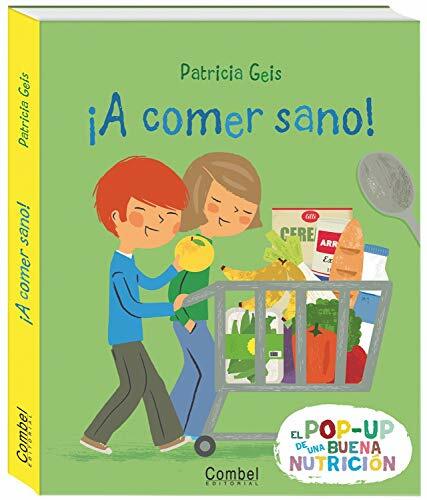 Aprender a comer sano también puede ser divertido con este libro pop-up vibrante. Los niños pueden seguir una lista de compra y elegir los alimentos del supermercado que se abre en las páginas centrales del libro. Y al final encontrarán una mesa puesta para que puedan preparar sus menús de alimentos saludables. El comer sano y el jugar se combinan en este libro verdaderamente único. Patricia Geis is a graphic designer, an illustrator, and the author of many children’s books, including ¡A lavarse los dientes!, ¡En marcha!, numerous installments of the Buenos hábitos series, the Buenos modales series, the Mi ciudad series, and the Niños y niñas del mundo series. We guarantee the condition of every book as it's described on the Abebooks web sites. If you're dissatisfied with your purchase (Incorrect Book/Not as Described/Damaged) or if the order hasn't arrived, you're eligible for a refund within 30 days of the estimated delivery date. If you¿ve changed your mind about a book that you¿ve ordered, please use the [Ask bookseller a question] link to contact us and we'll respond within 2 business days.